Upon delivery trees should be stored in a shaded area out of direct sunlight and wind. If natural shade is not available, a shade structure should be built. Standing trees upright allows for better air circulation and usuallly takes up less room. Storing butts on grass, mulch or sawdust helps retain the trees moisture. Frequent sprinkling will also help maintain moisture. Emphasize the fresh cut. The customer will have 5-6 hours to get the tree in water without the necessity of making another fresh cut. If the tree is not going into the house immediately it should be stored in a bucket of water away from wind and sun. Promote the use of large water capacity stands. Large balsams fir trees can drink over a quart of water per day. Do not let the stand go dry or the tree will seal itself and a new fresh cut will be needed. The only essential ingredient for maintaining tree freshness is plently of clean water in the stand. Research has shown that additives such as aspirin, clorox, sugar and 7-Up, as well as commercial products are of no real benefit. 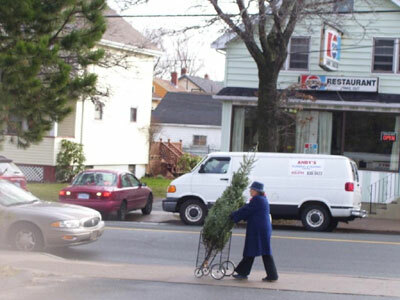 Cut Christmas trees are a perishable item and have a shelf life. Avoid taking early deliveries. The later the trees are cut the better.